A delicious yogurt flavored w/ chopped shallots. Combination‎ of yogurt & chopped cucumber, flavored w/ mint. Garbanzo beans pureed w/ tahini. Panir Sabzia Colorful Plate of Imported Feta Cheese, Walnuts & Fresh Herbs (Mint, Basil, Watercress, Tarragon & Radish). Cooked grape leaves, filled w/ ground beef, rice, tarragon, split peas, green onions, basil, parsley & fresh herbs. Fried & cooked eggplant w/ topping of kosh, mint, & fried onion. Combination of fresh chopped cucumbers, tomatoes, parsley, onion, & our house dressing (olive oil, fresh lemon juice, black pepper). Combination of ice berg lettuce, tomato, cucumbers, bell pepper & cabage. Combination of tomatoes, cucumbers, feta cheese, olives, & basil w/ lemon sauce. Charbroiled bell pepper, onions & tomatoes. Delicious marinated charbroiled boneless chicken breast & leg served on green salad. Basmati rice mixed w/ black cherries served w/ boiled chicken. (Becareful of the cherry pits! 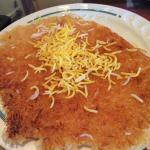 Basmati rice mixed w/ green beans, tomato sauce & diced beef, served w/ one skewer of ground beef kebab & shirazi salad. Basmati rice mixed w/ barberries & saffron baked in oven served w/ boiled chicken. Mixture of almonds pistachios, sweet orange peel mix w/ basmati rice. Raisins, lentils, date, saffron, mixed w/ basmati rice. Parsley, cilantro, chives, kidney beans & herbs, cooked w/ veal shank, served w/ basmati rice & crispy rice. Cooked walnuts in pomegranate sauce, served w/ chicken breast & a side order of basmati rice. Sauteed eggplant cooked tomato sauce, yellow peas & onion, served w/ beef & side of basmati rice topped w/ saffron. 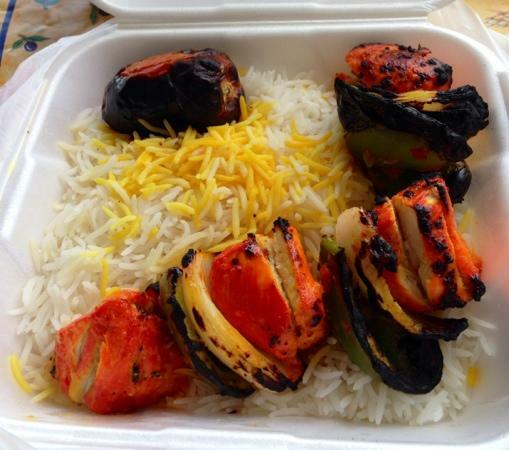 All served w/ imported basmati rice & charbroiled tomato. 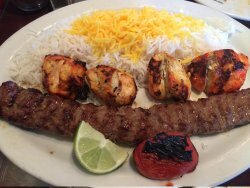 Kabob (Koobideh)Skewers of Juicy Strips of Charbroiled Seasoned Ground Beef. Charbroiled of filet mignon marinated in our special sauce. Charbroiled juicy large chunks of filet mignon marinated, skewered w/ onions, tomatoes, green peppers. Seasoned ground beef & filet mignon. A combination of tenderloin beef, & strip of seasoned ground beef. Our finest cut of charbroiled boneless baby spring lamb tenderloin marinated in our delicious house sauce. 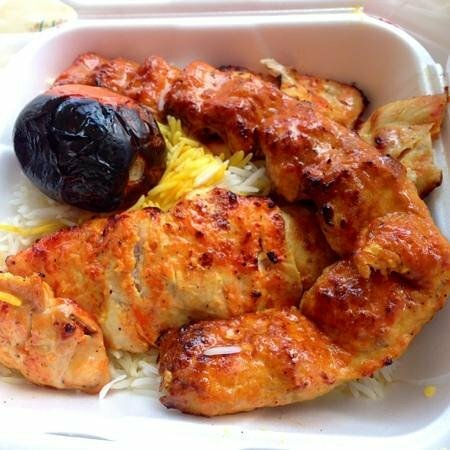 The most delicious & juicy boneless chicken kabob, one strip of charbroiled ground beef, two pieces of charbroiled lamb chop. Shish kabob, koobideh, & lamb chop. Delicious marinated charbroiled, cornish hen. Juicy strips of ground boneless breast of chicken. Delicious marinated charbroiled, boneless breast & leg of chicken. Thick strips of juicy marinated charbroiled boneless chicken breast. Delicious marinated charbroiled chicken skewered w/ onions, tomatoes, green peppers. Combination of one strip of ground chicken & thick strip of juicy marinated charbroiled boneless chicken breast. Fresh filet of lake superior white fish marinated & charbroiled w/ sabzi polo. Marinated in pesto sauce w/ a green salad. Shredded iced flour in sugar. Flour, honey, rose water & sugar. Flour, honey, rose water, pistachio & almond. Flour,‎ honey, rose water & sugar. Eu visitei este lugar em várias ocasiões e achei a comida e serviço a ser consistentemente bom. HOK ------ >>> NOOOOOOOO GOOOOOO !!!!! Espetinhos são muito bons com um monte de sabor, eu também recomendo o paneer subji. As nozes e queijo feta ir bem com pão. Os funcionários e antigos clientes da empresa respondem rápido a dúvidas sobre House of Kabob.